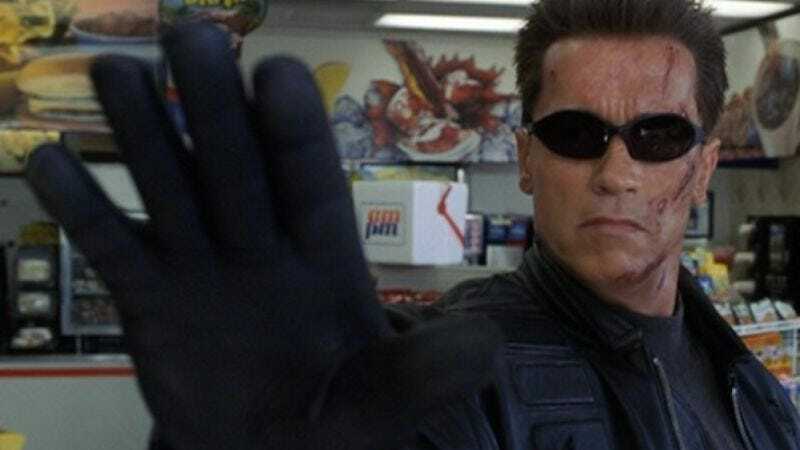 As reported by Deadline, James Cameron recently told the audience at a screening of the original Terminator why it still makes sense to keep casting Arnold Schwarzenegger as different versions of the eponymous killer robot. The question comes from the idea that—since the Terminators are machines—they shouldn’t show signs of aging, but Schwarzenegger is a real human man, and thus, has aged. Rather than explain to these easily confused sci-fi fans that putting the name of a famous person on a movie makes it more likely that people will see it, no matter what narrative justifications have to be made, Cameron actually offered a real solution to the problem. Cameron says that the skin covering the Terminator’s machine skeleton “was actually not synthetic, that it was organic and therefore could age,” which, sure, makes a fair amount of sense. In fact, this explanation that Cameron probably just came up with on the spot actually matches some statements that Schwarzenegger himself made back in March, so that means it must be pretty solid. But, in order to test whether or not this explanation really works, here’s a fun experiment that we can all do at home: Get any machine, like a car or one of those Gone Girl robot dogs. Then, cover it in human skin and wait for about 30 years—the length of time from the release of the original Terminator to today. While still a machine at heart, the outer covering will have slowly degraded just like it would on a real, living thing. That’s not science fiction, that’s just science!